Born and raised in Fargo, ND, Isaac Olson has been with the RedHawks since 2012. 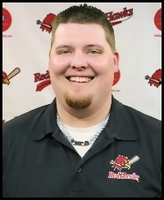 He started as the RedHawks Club House Manager and remained in that role until 2014, when he became a gameday staff member for the next two summers. In 2017, he was hired on full-time as Box Office Director. Now as the Director of Ticket Operations, Olson overseas all aspects of the RedHawks ticket department and box office. He previously held positions with Microsoft and CI Sport in Fargo. Olson resides in South Fargo, with his wife, Bobbi, and son, Easton.